Offering flexible work schedules can help businesses attract the kind of workers they want and help retain the employees they already have. Do your collaboration technologies enhance or impede your digital workplaces? Do you have the best technologies or are there other impediments? How flexible are your working conditions? In today's world, working is not like a manufacturing line where we all have to work in concert otherwise production stops. I recently read Polycom's whitepaper, "The Changing World of Work," and it inspired me to take a deeper look at the flexibility -- or lack thereof -- in the workplace. The Polycom-commissioned survey was conducted by Morar Consulting, with data collected from 25,234 consumers in 12 countries: United States, Canada, Brazil, Japan, Germany, United Kingdom, India, Singapore, Russia, France, Australia, and China. Of those surveyed, 55% had job titles managers or above, 58% were responsible for care in some capacity, and 68% surveyed were parents. You don't have to be a millennial to want a flexible work schedule. If you are trusted enough to work remotely, then you should be trusted to work at your own schedule, as long as it's compatible with others. Working remotely simply fosters the creation of digital work spaces. By definition, a flexible work schedule is dependent on an employee's availability to cover all aspects of their job during all hours of the day for which a business makes products or serves customers. It used to be that flexible working meant the option of working from home or away from the office. The focus now is on working anywhere. The use of laptops, tablets, and cell phones has promoted the desire for working anywhere. Employees now look to organizations to evaluate their flexible work policies before accepting a job. Non-flexible work polices can discourage working for a business. The technology is already here. In today's global workplace, nearly two-thirds of the workforce can take advantage of working anywhere. This is up from only 14% in the May 2012 survey, according to Polycom. The most popular benefit reported for working anywhere is its contribution to a better work-life balance. This is true for those surveyed in China, Canada, and Australia, with 68% of respondents or more favoring flexible scheduling. A surprise to some managers is that productivity actually increased and was a benefit of the flexible work scheduling, with 75% of Brazil respondents indicating that their productivity had improved. However, as with anything, there is a downside. Russian and Indian respondents felt that the biggest concern was being perceived as less hard-working if they adopt the flexible scheduling remotely. 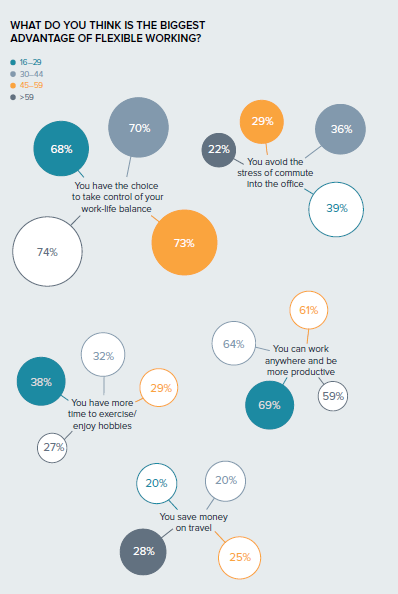 The below graphic from the Polycom survey indicates that millennials take advantage (70%) of working anywhere. The older generation, 45 to 60 year-olds, take advantage 51% of the time. Employers are changing as well. For millennials, only 15% of their employers do not offer the option to work anywhere, compared to 36% of their parent's generation. Another variation discovered in the survey, is that millennials like to work for technology companies. The 45 to 60 year-old group named manufacturing as their employer, which is more likely to require employees to remain on site and not allow remote working. Furthermore, the 45 to 60 year-old group is more concerned about the stress of commuting than millennials, and therefore look towards working remotely as a big advantage to avoid the commute. The right collaboration technologies -- especially video -- can significantly benefit successful working anywhere approaches. As the survey revealed, most countries use collaboration tools regularly, with Japan being an exception. In particular, 64% of Brazilian respondents say they use video to communicate several times a day. Video is also a significant element in building relationships in a work-from-anywhere environment. Sixty-four percent of respondents said that video conferencing technology made it easier to create and sustain relationships in countries like India and China where workers may be more geographically distributed. But video conferencing is not the only tool -- audio conferencing, emails, and instant messaging help build the relationships, team spirit, and productivity. Those who use video conferencing tools are also very willing to pick up the phone or text in addition to video conferencing.